We were so blown away to get a special request for our Football Field Table Cover and Goal Posts at the end of last week. Party planner to the stars Sharon Sacks of Sacks Productions requested to have them and use them on her appearance with The Kris Jenner Show, where she showed some great ways to plan your own football party this season. So happy to see our Nerf Party on TLC Parentables today. Our Nerf Birthday Party Obstacle Course was featured today. Woohoo! 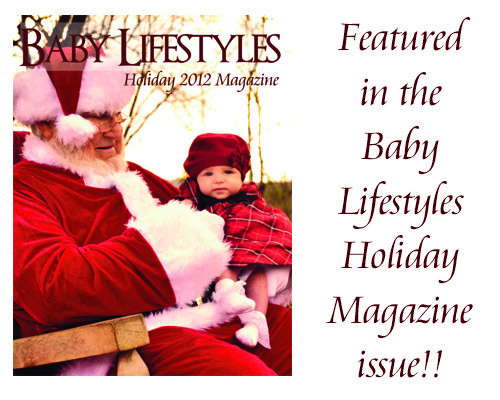 Today we are celebrating the feature of our Peacock Gold & Glam Holiday party in the popular Baby Lifestyles Magazine! If you haven’t seen this party, you are missing out on jewel toned goodness that is perfect for just about any occasion, including some fabulous recipes for Christmas. Check out the full issue below. Thank you so very much to Lauren for thinking of us for your magazine, we are truly grateful! 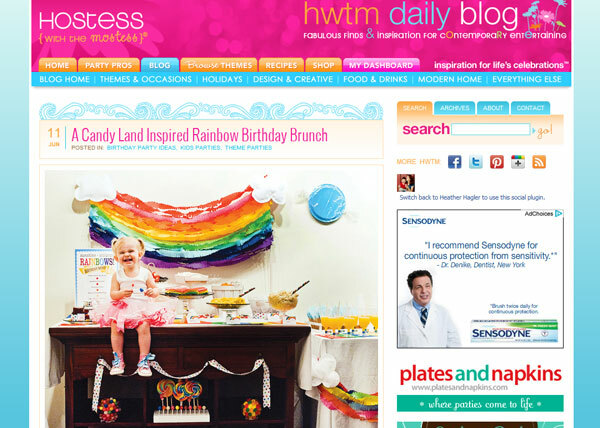 We are super excited and proud today to be featured on the Hostess With the Mostess blog for our Sunshine, Lollipops and Rainbows party. Thanks again to the staff at HWTM for the opportunity to share our party designs with your readers! To see the entire post from HWTM click here. To see the party photos on our website click here. The printables set featured in the photo is available in our Etsy shop here. "Navy & Lavender is a gifting company formed by two imaginative girls who met while working at Vera Wang and instantly fell in love with all things bridal. After carefully planning their own weddings, Michal and Michelle wanted to branch out and help others find unique ways to make their events more memorable too. And not just for weddings, but for all life’s important occasions from baby showers and birthdays to anniversaries and corporate milestones. Each idea is given the N&L Notes wax seal of approval – not only the symbol of the blog, but also a reminder to readers to make their own mark on all that they do!" This must be the week for dessert lust because this makes feature number two for us this week and we are just in awe! Thank you so much to the lovely ladies at The Frosted Petticoat for featuring our sparkling red apple cupcakes on their blog this week. The Frosted Petticoat ladies also have an Etsy shop of their own selling delish delectables, so be sure to check them out! Tons of whimsical chocolates in all shapes and sizes for you to drool over! 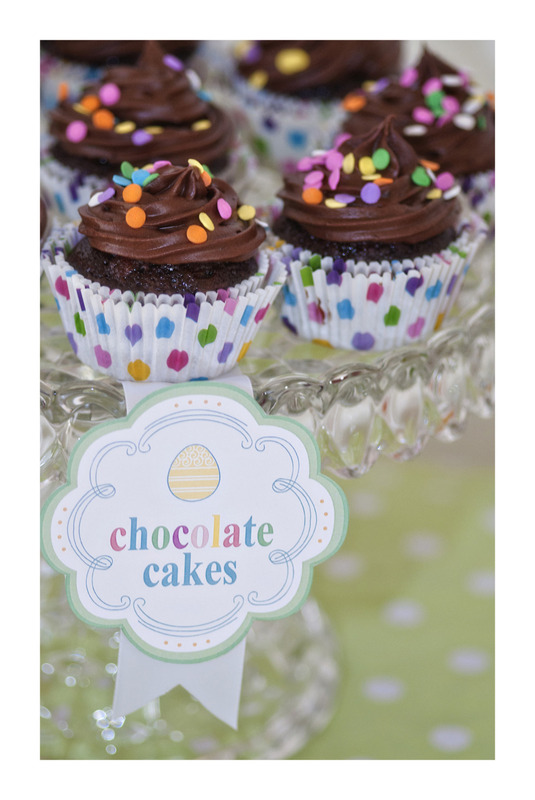 We discovered a feature post about our cupcake photos on the blogsite Adorned this evening. Thank you so much for visiting us Mackenzie! We love your blog design, so clean and fresh! "Hello, my name is Mackenzie...This blog is my little labour of love. Born from the idea of creating a catalogue of all the beautiful items and images I stumble upon, this forum has become a welcomed outlet for me to share my inspirations and fascinations with others. I am so grateful for the opportunity to contribute to a growing online community of creative minds and to be given the opportunity to share my thoughts with all of you on a daily basis. Currently working as a freelance interior designer, I continue to dabble in both graphic design and photography. I adore fresh cut flowers, white washed rooms and the colour pink. In all that I do, I have a love for the handmade and a passion for the art of creating." Today we were pleasently surprised to discovered we were blogged about on the Indie Pretty Projects site! This article was from February, but we still want to give a shout out to Ashley and say THANK YOU! We found out due to an alarming increase in blog traffic today that we were mentioned in the Pinterest Weekly Round Up blog entry for ﻿6.18.11! Awww! Thanks Pinterest we love you too! We are so excited, no… exstatic, or maybe even over the moon about our feature on Amy Atlas Blog this week. 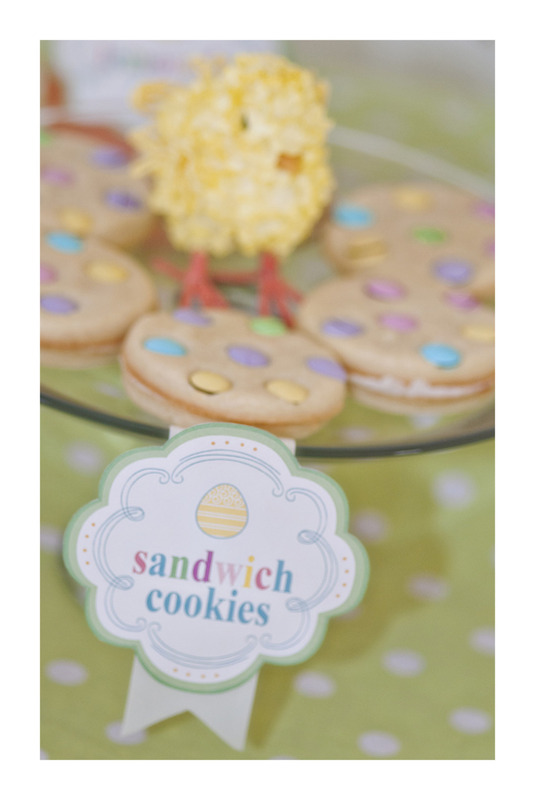 We recently put together a Dessert Table for our nephew, combining his birthday with an Easter/Spring theme. We never dreamed it would be successful enough to be featured on a blog that we look to for inspiration. A HUGE thank you to Amy Atlas and her team for considering us for the feature and providing us with your creative genius to aspire to. “Amy Atlas is a coveted entertaining expert, baking and crafting stylist, and is internationally recognized for creating the stylized dessert bar trend. Amy’s work has appeared multiple times in InStyle Magazine, Parents Magazine, Better Homes & Gardens, The New York Times, Every Day with Rachael Ray, The Los Angeles Times, Food and Wine Magazine, Life & Style, Gotham, New York Magazine, Martha Stewart Weddings, Brides, and many more. Her work has appeared on thousands of top US and international entertaining and lifestyle blogs. In 2008, Amy created Sweet Designs to share her styling tricks, recipes, diy tips, and behind-the-scenes of her work. InStyle Magazine named Sweet Designs one of the best entertaining blogs in November 2010. From a very young age, Amy was entertaining for friends and family. By the time she reached college, she had perfected her talent for her signature dessert tables. After several years of working on political campaigns and practicing law, Amy decided to return to her creative passion for entertaining and party planning. Desserts bring back many sweet memories for Amy so it is no surprise that she would specialize in her signature dessert tables. Amy’s fondest sweet memory from childhood is of sitting in her grandmother’s sunny kitchen on a spring afternoon, watching her pull homemade rocky road cake out of the oven. While waiting to lick the bowl, Grandma would let Amy drizzle caramel icing all over the cake. To this day the smell of rich, melted caramel still reminds Amy of that wonderful spring afternoon, when it felt like the world belonged to just the two of them and the essence of happiness was warm rocky road cake. Amy lives in New York City with her husband, Rick, and sons Zachary and Joshua. 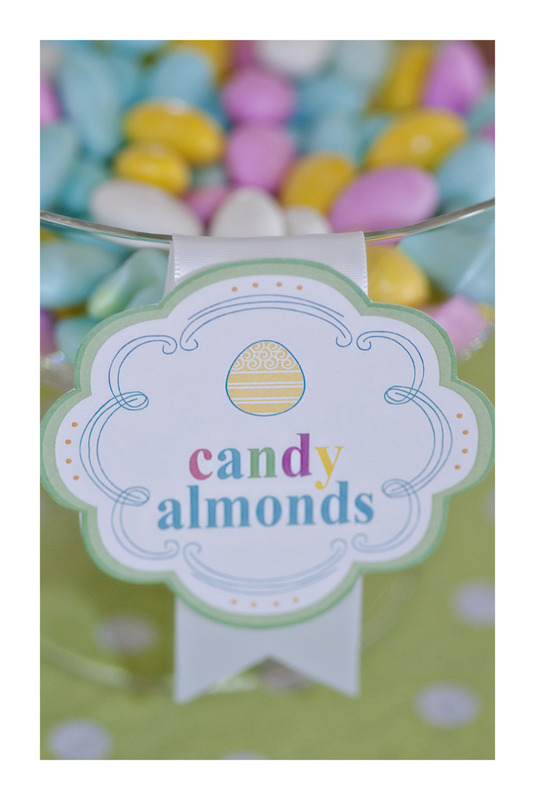 If you love this Easter/Spring theme, we offer it FOR FREE as a printable download here. Today we were pleasantly surprised to find out our cupcakes have been featured on the Handmade Gazette website! We've been featured in the Smith Mountain Laker Weekly publication due out tomorrow! So exciting!